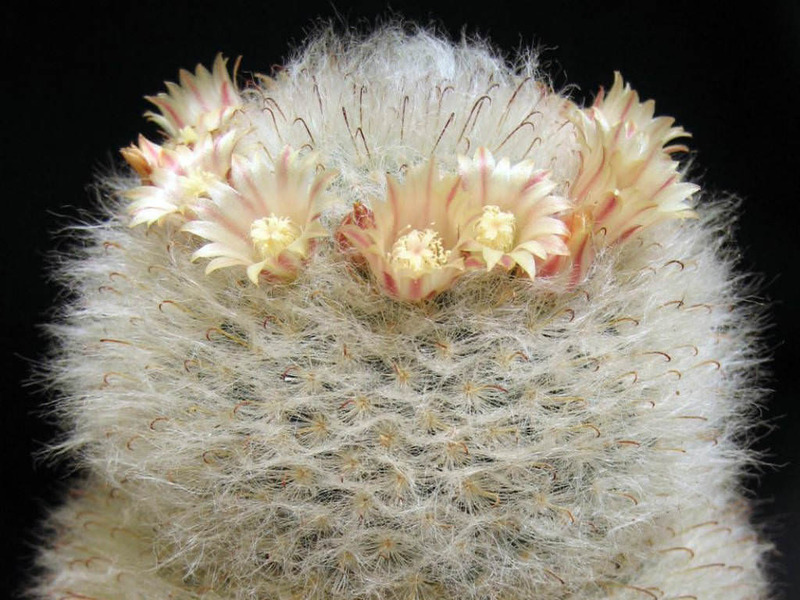 Mammillaria bocasana is a clumping, spherical, blue-green cactus, up to 3 inches (7.5 cm) in diameter, with white, hair-like radial spines (one hooked), up to 0.8 inch (2 cm) long and 1 to 7 reddish-brown central spines up to 0.4 inch (1 cm) long. 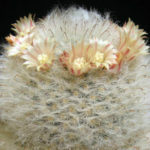 The flowers are funnel-shaped, creamy white to pinkish, up to 1 inch (2.5 cm) long and up to 0.6 inch (1.5 cm) in diameter. The fruit is cylindrical, rosy-pink to red and up to 1 inch (2.5 cm) long. 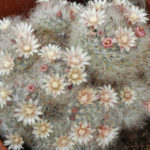 This cactus is only suitable for outdoor life in USDA plant hardiness zones 8 to 11. 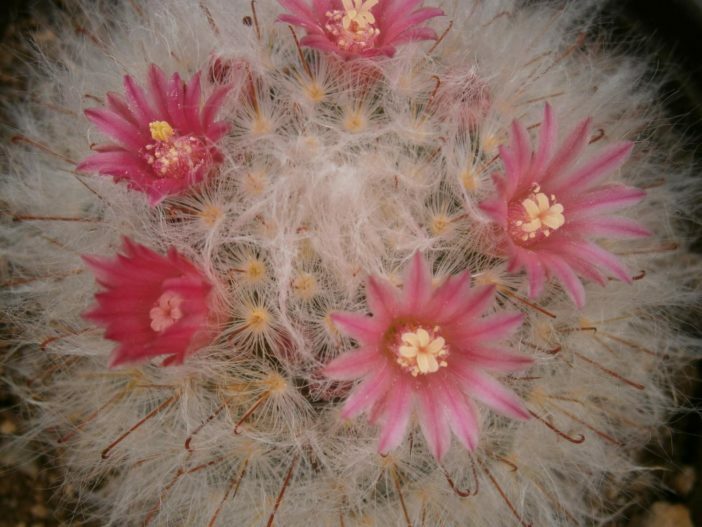 For gardeners in most zones, only indoor potted Powder Puff Cactus is an option. 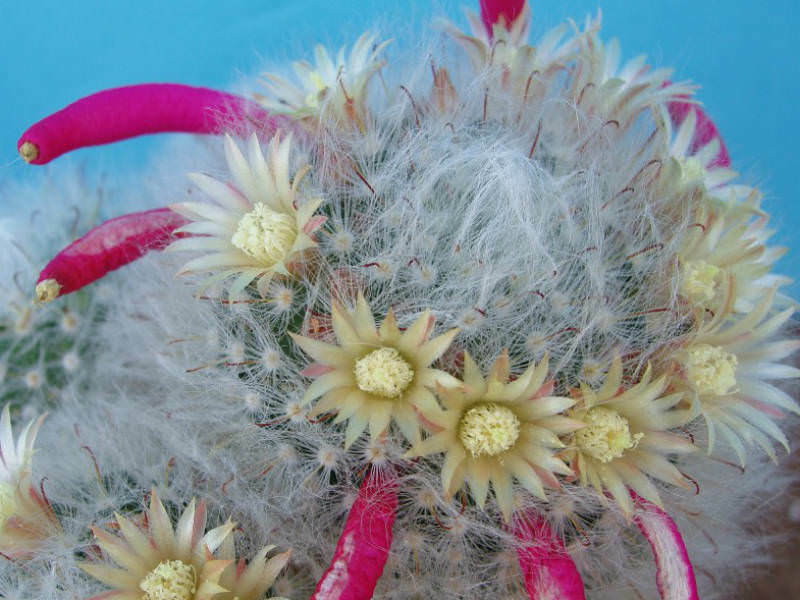 Powder Puff Cactus needs plenty of sunlight and warm temperatures. It is happy as long as temperatures are between 70 and 80 °F (21 to 27 °C) and at least 8 hours of sunlight. During the winter, it become dormant and can be held in a dry, cool room of the house. The exposure to temperatures between 60 and 65 °F (16 and 18 °C) helps encourage flowering in spring. 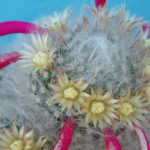 Move Powder Puff Cactus outside in summer. The potting soil needs to be porous so it can drain well. Allow the soil to become nearly dry between waterings, but then water thoroughly. Never let the pots sit in water. Suspend watering in the winter, but mist occasionally. 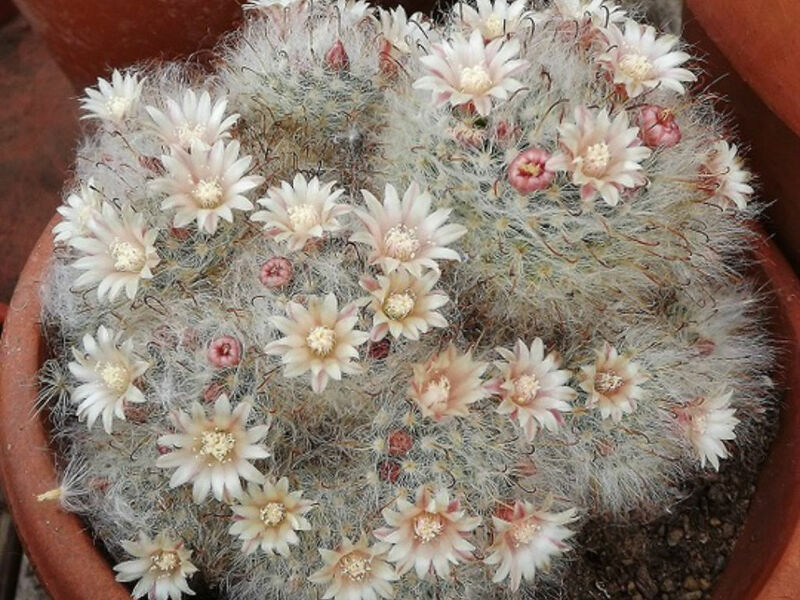 Mammillaria bocasana is native to Mexico (San Luis Potosi, Zacatecas).